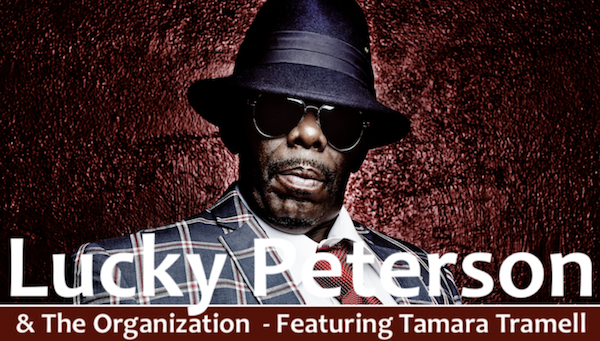 Legendary American Bluesman Lucky Peterson, master of the blues guitar and the Hammond B3 , is soon to celebrate his 50th Anniversary of performing professionally. Born in Buffalo, NY in 1964, the son of James Peterson, a renowned blues guitarist and owner of “The Governor’s Inn”, a popular roadhouse club in the city and regular stop for some of the most famous bluesmen of the day. With all of the incredible talent and music going through the club, Little Lucky Peterson, as they called him at the time, learned very early in his life that his true calling was music, and in particular the Blues! Already, at the age of 3 Little Lucky Peterson gave his first concert and, instead of going out and playing with the other children, he was hanging around the club learning from and starting to play with the numerous artists that passed through. One of the top artists of the day - Willie Dixon, recognized his talent and produced Little Lucky Peterson’s first album when he was only 5 years old - “Our Future” released on the label “Today/Perception Records”. Invitations immediately started to pour in for him to perform live on national TV from such major television programs as the; “Ed Sullivan show”, the “Tonight show” and “What’s my line” and many others….. With this first album Little Lucky managed to reach out and grab the attention of the whole country with a hit song written for him by his father “1-2-3-4” a cover version of James Browne’s big hit “Please, Please, Please”. And the rest is history! plus guitar, bass, drums, vocals.